I do not like to be surprised. When I turn on my laptop, I want it to turn on, when I go on vacation, I want the 4 star hotel to be a 4 star hotel, when I code a website, I want it to work. But when I surf the Internet, I want to be surprised. As much as possible. Because surprise makes me smile. Amazingly, there is a company that is entirely devoted to creating surprises, the aptly named Surprise Industries. Three young women entrepreneurs founded SI, a New York company that plans surprise events for individuals and businesses. Think trapeze lessons, private beer tastings and a zombie birthday party complete with actors in costume and a terrifying alleyway ambush--the possibilities are endless. The clients themselves can be the surprisees, or they can hire the company to surprise someone they know. Surprisees have no idea what they're paying for, aside from some hints, a location and an arrival time. They're asked what kind of experience they want (adrenaline-spiked, romantic, mysterious) and what the occasion is. Then, Surprise Industries' team, including 13 part-time "agents of surprise" on call for emergency brainstorming sessions, makes it happen by contacting the right people and putting together the surprise. It turns out that SI has inspired a movement. People want to surprise themselves. In their blog, SI reports the story of Jia Jiang who has been pursuing an unusual goal: his aim is to get rejected 100 times. He’s been rejected by zookeepers who wouldn’t let him feed a lion, by a radio station who wouldn’t agree to feature him in an on-air interview, and by Domino’s Pizza who wouldn’t let him deliver a pizza. It all started on July 4th of 2012 when he had an epiphany. He realized his fear of rejection was preventing him from achieving his dreams. Jia decided to embark on a “rejection therapy” quest in the hopes that he would become desensitized to rejection, and would be liberated to pursue the life he wanted. After a year of making difficult asks, Jia has actually had a surprising amount of success. A Krispy Kreme employee created a reproduction of the Olympic Rings symbol out of donuts, just because he asked. He’s also managed to speak over Costco’s intercom, sit in the driver’s seat of a police car, and fly a plane, among many other adventures. Jia says he’s surprised by the amount of success he has had (where "success" means having his request be met, as opposed to the "success" of being rejected). His stories are evidence that people will surprise you, if you only let them. 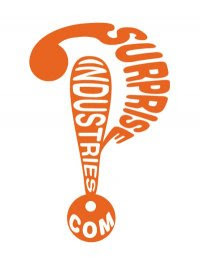 Thank you, Surprise Industries, your existence surprised me.